Many people assume that Japan’s largest trading partner is the United States. They focus heavily on the United States economy when making decisions about Japan’s economic growth. However, China accounts for 19.4% of Japanese exports (vs. 15.7% with the United States) making them far more dependent on their neighboring country. Japan’s third largest export market? Europe. 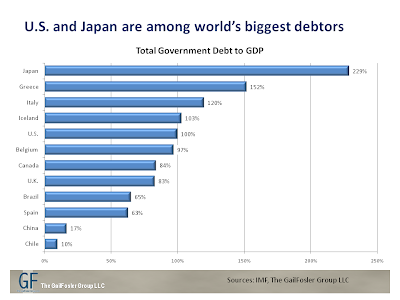 A topic not discussed today (just as no one talked about Greece in 2009 and Italy in 2010) is that Japan currently has the worst government bond balance sheet in the entire world – by far. Their current debt to GDP, the broadest measure of a government’s ability to pay back their debt now stands at 220%. In comparison, Italy currently has a 120% debt to GDP and they pay 7% on their 10 year bonds. Japan now pays less than 1% on their ten year bonds. How is this possible? Japanese citizens have an extremely high savings rate. They have put an enormous portion of their savings into Japanese government bonds, which has allowed the government to run enormous deficits while only have to pay out rock bottom interest rates. Things are changing now in Japan, creating a worrisome storm cloud ahead. 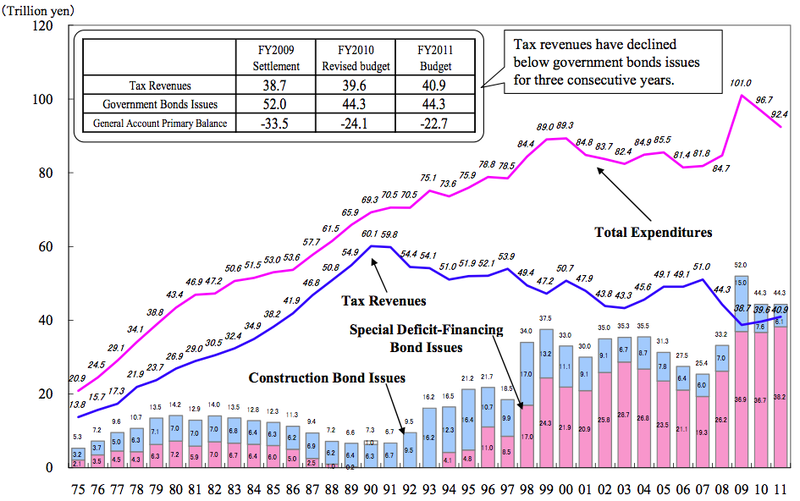 The following shows Japan’s expenditures vs. tax revenue, a worrisome widening gap. Japan's population is aging rapidly and entering the retirement stage of their life in mass. In order to finance their monthly living costs these retired Japanese citizens will call their investment broker and ask them to sell some of their investments and send them the cash to buy groceries and pay their mortgage. What does selling securities mean? Selling government bonds. This is going to create a cascade of selling at a time when the Japanese government needs funding more than ever. The tsunami in March of last year only compounded the problem as government funds were needed to support the crisis. 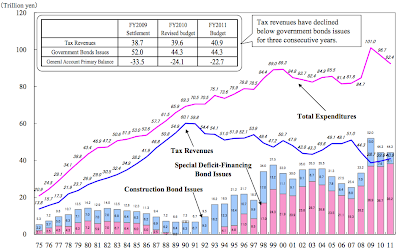 In 2012 Japan announced plans to spend a total of $1.16 trillion. $566 billion will need to be financed with new debt. This means close to 50% of their entire budget must be paid for with new bonds, an unprecedented statistic. Social security expenses will account for 52% of the spending in the coming year. However, looking under the surface you find that the numbers are actually even worse. $137 billion in spending was pushed down to the state and local government level in order to keep it off the national balance sheet radar. A slowdown in China will cause a higher unemployment rate in Japan and lower the savings rate and internal bond funding further. Japan is also now running consistent trade deficits, instead of a consistent surplus which always helped their economy in the past. The continued rush away from European assets as well as a coming panic in the Japanese bond market will provide a temporary period of strength in the US dollar. However, the same exact scenario that is taking place today in Italy and will soon be hitting Japan is waiting for the United States. "Japan's population is aging rapidly and entering the retirement stage of their life in mass."